Frankfurt – Prolight & Sound 2018, Hall 3.1 C90. 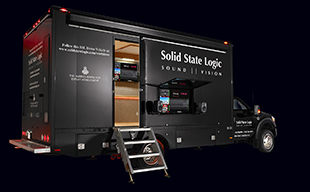 Solid State Logic is pleased to announce that ProLight & Sound 2018 will see the European premiere of the 32-fader version of the System T – S300 compact broadcast console, alongside all of the acclaimed SSL Live console range and a selection of SSL’s hybrid studio production technology that includes the AWS 948, Nucleus2 and the Sigma-Delta remote controlled analogue summing system. The System T - S300, compact broadcast console offers an outstanding combination of performance and value for a wide range of broadcast installations and OB vehicles. The S300 is a fixed layout compact control surface that can be combined with the complete portfolio of SSL’s ground-breaking System T network objects: Consoles, remote tiles, touchscreen interfaces, Tempest Processing Engines, remote PC software and Network I/O. It can be specified as part of a larger System T installation or in stand-alone configurations for smaller broadcast facilities or OB vehicles. S300 presents the extraordinary power and versatility of System T in a streamlined console layout that remains intuitive for operators with a wide range of skill levels. S300 is now available in both 16+1 faders and 32+1 fader versions. S300 can connect to either a Tempest T25 (256 paths @ 48kHz) or a T80 (800 paths @ 48kHz) Processor Engine and runs the same software as the larger S500 surface and TCR (Tempest Control Rack).